“Yeah, I know that story. Okay, I’ll see you later then,” he said and hung up unceremoniously, like someone who is unused to talking on the phone. Out of all my children, ten-year old Joey is probably the most like me. We love to read and we love a good meal. We are fairly slow to anger, but when we do, watch out. Nothing makes us happier than a large crowd, a joke or a funny story, and big piece of cake. We are also both well, cavalier, when it comes to things like following directions, prep work, and details in general. Joe refers to our shared attitude as “fast and furious”—we like to get things done quickly, without a lot of regard for minutiae. Although we finish every book and piece of cake we start, Joey and I rarely see a project or craft through to the end. When my eight-year old self was presented with spelling words printed on a sheaf of dittos nearly thirty-two years ago—yes, dittos! the kind with deep purple-ink that smelled really good!— I tossed them aside with a combination of indifference, laziness, and eh, I got this. I did not, however, got this. “You’ll never forget the word you misspell. You’ll always remember it,” my grandmother told me when I complained to her about getting out in the second round. I had missed pecan—a word I had read dozens of times and eaten dozens more—by adding an “a” before the “c”. And sitting at the built-in breakfast nook in her darkened kitchen while she smoked and sipped scalding hot coffee after a long night of work at the Reader’s Digest, I thought about how right she was. I would never forget that stupid word again. I also vowed I would never eat a pecan again. Let’s just say, in the case of studying, my little apple didn’t fall far from his mother’s tree. Joey brought home a giant packet of words and flung them on the counter with an assortment of other odd items from his backpack: Manga drawings, a whistle, a rubber band bracelet. I asked him what his plan was for reviewing them and he just shrugged. I decided to follow his lead. However, Joe and I did not see eye-to-eye on this particular approach, and he tried to get Joey to commit to a more formal plan; he would review the words on his own, and Joe would quiz him after dinner. After a couple of frustrating evenings trying to get him to cooperate—to work instead of sketching Manga characters–Joe also gave up. A few times Joey half-heartedly scanned the lists before bedtime, but he declined our help every time we offered to work with him. The morning of the bee I asked him if we should look at the words again, but he opted to go sledding outside before the bus came. Well, whatever. I thought as I watched him put on his gloves. It’s his decision. When I got to the school to watch him, I was unnerved by how many kids and teachers and parents were sitting in the cafeteria, while the fifteen contestants perched onstage in folding chairs. Maybe we should have taken this more seriously, I thought. But Joey didn’t look the least bit nervous, and when they called him up the first time, he sauntered to the microphone as cool as a cucumber. It took me a moment to register the name Joseph, so accustomed I am to his pet name, Boochie. His word was “trifle”, and he spelled it like a champ. I realized I had been holding my breath, and I let out a long sigh. For the next round, he had “talisman”, and again I exhaled the tiniest bit. He knew this word. I knew he knew it. “Sure. Talisman is a power that may seem magical and that allows someone to be very effective, successful. Talisman,” the moderator repeated. I felt my face flush and all at once my heavy black coat seemed hot, restrictive. Joey looked slightly stunned as he spun back towards his chair. At the end of the round, he got back up heavily and descended the stairs of the stage to join the rest of the kids at the table. His face was an uncharacteristic red as he sat down, and I watched him reach up underneath his glasses and furtively wipe away a tear. Is he crying? I tried to catch his eye to give him some sign of encouragement—a thumbs-up or a wink—but he slumped over with his head on his arms. I should have made him study more it’s really noisy in here he never cries maybe Joe was right I need to push him harder who comes up with these words anyway they are only in fifth grade look how nervous that poor girl looks it’s like a pressure cooker up there I can’t remember the last time he cried and it is so freakin’ hot in here oh Boochie I am so sorry. It was my pecan to his talisman all over again. It is so unfair that we not only have to make our own mistakes in life, but then we get to re-live them with our children. We have to fall off bikes and spill milk and misspell the words all over again. And it’s definitely harder the second time around. How do I explain to him that this moment in time says nothing about him, and yet it says everything? Yes, it’s just one single word, but it’s also his habit of not studying, of choosing sledding over reviewing, drawing over spelling. During one of the breaks, I stopped at his table on my way out to say goodbye, and he squeezed his arms around my waist for a long moment. Another sweet little boy in a red fleece started to say he couldn’t believe he misspelled “extinguish”. That afternoon I dropped Henry off at preschool and hummed along to Christmas carols and picked out rainbow looms, and every now and again my mind would wander back to the middle school cafeteria, to Joey and the spelling bee. I would remember the way his face looked as he came off the stage, and my stomach churned. Or is it better to let him take the lead, to decide his own spelling bee fate and learn from his mistakes? At this point, I have no answer to this riddle of parenthood. All I can say is my heart broke into nine thousand pieces watching my son’s heart break into nine thousand pieces in the middle school cafeteria. Maybe what my grandmother really meant to say when we sat together in her kitchen over three decades ago was that you will never forget the way it feels to misspell the word, the way your stomach drops and your heart hammers when you have to step down off the stage you so loftily occupied just moments before, knowing your moment is over. And the memory is your incentive for future spelling bees, future bike rides, future chances to study. I never did make it to another spelling bee in elementary school, but after a while I started eating pecans again. And now I love them, especially in carrot cake. Later that afternoon, I met Joey at the bus with Jack in tow. With autism’s usual tact and diplomacy, Jack demanded to know if Joey won the bee that afternoon. 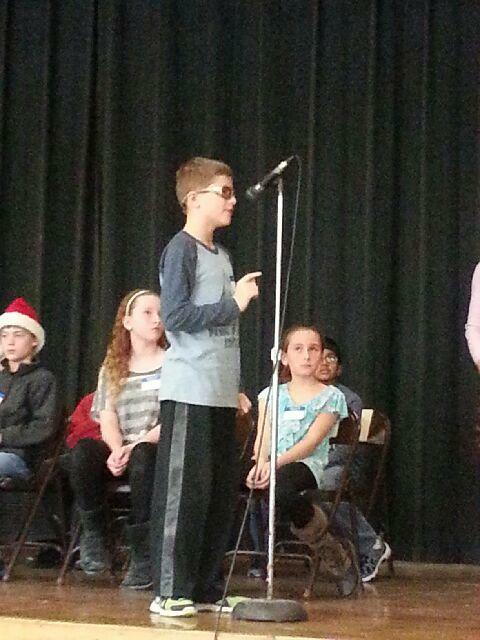 “When I am in the spelling bee, I am going to WIN IT. I am a GOOD SPELLER.” Jack announced as we tromped up the front porch and into the house. Talisman. Magical powers. He’s learning something. I misspelled the word “porpoise” in my middle school spelling bee. There were only about a dozen left on stage and I was so sure of myself that I spelled it wrong with great confidence. I remember that feeling in my gut exactly. This was my daughter’s second McK spelling bee…the angst after losing in the first round last year was heightened by the memories of trying her hardest not to cry on stage. She looked up, down all around and held it all in. Last year, another boy had to get off stage as he was bawling so badly. I said, on the phone from Florida with my youngest at cheer comp, “you are a winner, you have made it this far and that’s a great accomplishment”. Spell one right and she will have gone further than last year…and she did! Super star!!! Our kids are learning good lessons about risk, trying new things, putting themselves out there and the consequences that come with it. (I know I couldn’t have gotten up there in front of the school at their age!!!) She was relieved for it to be over and happy with her performance. I wanted to crawl through the phone when I saw the photo of my daughter on stage with swollen eyes from crying the night before. Great work spelling bee champions!!! It is so wonderful how Joey “get’s it” and how Jack is “getting it” letter by letter. Your stories always make me smile and warm my heart.